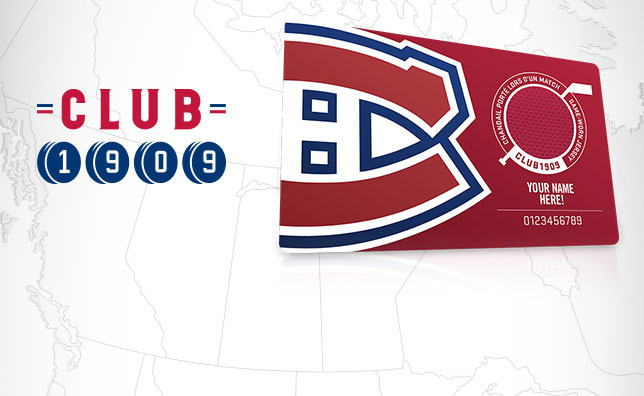 MONTREAL– The Montreal Canadiens officially launched today their new “Club 1909” fan program, an initiative aimed at uniting all faithful fans of the team around the world. The program will be supported by the largest and most expansive media campaign in franchise history, part of which was unveiled earlier on Wednesday in the first of a series of irreverent videos featuring Montreal native and diehard Canadiens fan Jay Baruchel, star of such international films as Million Dollar Baby, Tropic Thunder, Goon, and This is the End. Fans who visit the Club 1909 Web site (www.club1909.com) will be able to register for either a digital membership at no cost or a premium membership for a one-time fee of $29.99. Digital members will then receive a personalized card on their mobile device that will allow them to gather points for all of their daily actions involving the Canadiens, be it interacting with the team on social media, watching or listening to games, or purchasing club products online or at the Bell Centre. Members can then use their points to obtain unique items and money-can’t-buy experiences offered exclusively on the site. Premium members will receive double the points for the same actions, along with an industry-first: an RFID-enabled card with an embedded piece of authentic Canadiens game-worn jersey. Beyond the ability to gain points for ordinary acts of fandom, Club 1909 members will benefit from a very unique privilege – their name will be printed on a screen then embedded in the Bell Centre ice, allowing their support to be beneath the skates of their team at every single home game. From the Club 1909 site fans can also lend their voice in support of the club by uploading their own “Go Habs Go!” cheer, which could then be featured individually or added to a choir of international voices that will be played inside the arena, joining the 21,287 fans in the Bell Centre encouraging their team. With the participation of Baruchel and several Canadiens players including Carey Price, Max Pacioretty, David Desharnais, Brandon Prust and Brendan Gallagher, Club 1909 will be supported online through five absurdist shorts wherein the actor takes extraordinary measures to get closer to his favorite team. The first spot was released online this morning, while the remaining four will be unveiled through Saturday. The Canadiens produced the spots working with Rooster, a New York creative agency/production company hybrid known for its innovative work with such clients as Google, Red Bull and New Era. Fans are invited to visit the Club 1909 site starting today to register for the program. New features and benefits will continue to be added in the months ahead.